Today we’ve added the ability to browse and join discussion groups on Gliph! On the web app you can now “Browse Groups,” and we’ve added the ability to view Groups the mobile web and Android from the menu. After seeing how fun it can be to get started on Gliph and make new friends, we’ve decided to start featuring a selection of them. Some of the first groups we’re featuring are the ones that grew out of the Gliph Community. For example Bitcoin Discussion and Cat Appreciation. One of the groups we’re excited about is Rick and Morty fans. Rick and Morty airs during Adult Swim on the Cartoon Network and online. The show chose the Gliph group as their official home for for real-time chat for fans. We’re still exploring what can be done to make public groups great destinations on Gliph. 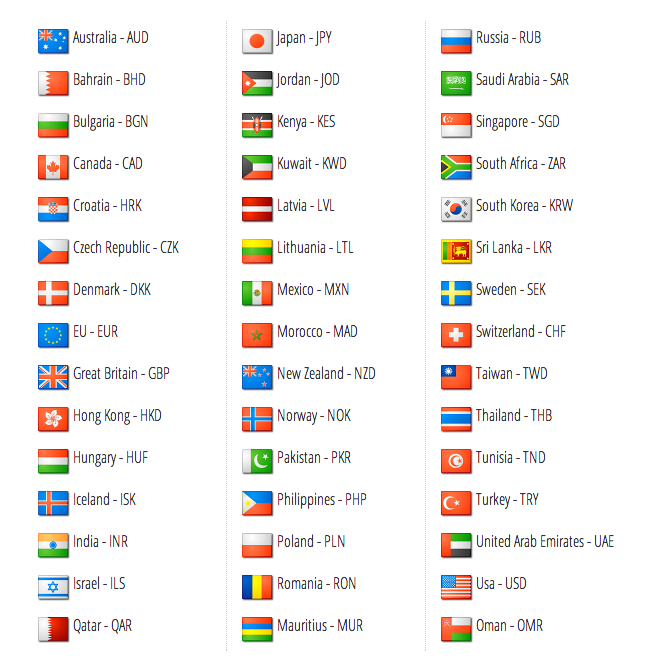 Here is a complete list of public groups available now, we’ll add more over time. If you have a group you’d like featured on the Groups page, please send a message to Support! This entry was posted in Gliph Android App, Gliph Community, Gliph Web App on February 25, 2015 by rob. Today, we released an update to improve Gliph’s notification service for group conversations. When someone sends a message to a group you’re in, your smartphone will vibrate and play your chosen notification sound. However, after the initial messages, Gliph will enter a cooldown period until you’ve visited the conversation and left it again. During the notification cooldown period, you’ll still get visual notifications but your phone will not vibrate or make noise. This cooldown period ends after five minutes. That way, if you just missed the first notification you’ll get another reminder about ongoing, unseen activity in your group. In case you did not know, you can shut off notifications for a particular group or private conversation. This allows you to more carefully control what conversations are important enough to interrupt your day. This entry was posted in Gliph Android App, Gliph iPhone App, Gliph Messaging and tagged push notifications on September 25, 2014 by rob. Today we’ve released the biggest update to the Gliph Android app yet. We’re happy to announce it is now just about equal with the Gliph iPhone application in features, even goes beyond it in some cases. We want to thank all of our Android users for their patience while we brought it up to speed. The new application is based on the new Gliph Mobile Web application, and joins the new Gliph Desktop Web and an updated Gliph iPhone application also released today. Gliph on Android now supports secure group messaging! You can use the app to assemble and manage your own groups from your existing contacts. You can also create a group and invite non-Gliph users to join at the time of creation. For more information about secure Group Messaging on Gliph please see this post. 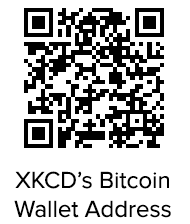 Donate to the XKCD web comic. The new Gliph Android app now allows you to transfer Bitcoin outside Gliph’s network. This means that you can pay with Bitcoin at any business that accepts Bitcoin. Dell, Expedia and Newegg are just a few of the many businesses around the world that accept Bitcoin. This entry was posted in Bitcoin, Gliph Android App on July 21, 2014 by rob. This week we’re unveiling updates to both the Gliph iPhone and Android applications. The main new feature in both is GliphMe, but some extra subtle improvements are in both apps. GliphMe is a powerful little link for connecting privately with friends and strangers. When someone clicks a GliphMe contact link they are presented a chat box that lets them communicate with you. You get push notifications of the new message on your iOS device and can reply directly from the app. Read the blog entry on the feature or learn more at the GliphMe home page. Connect View improved – We’ve cleaned up the view you use to add friends on Gliph. 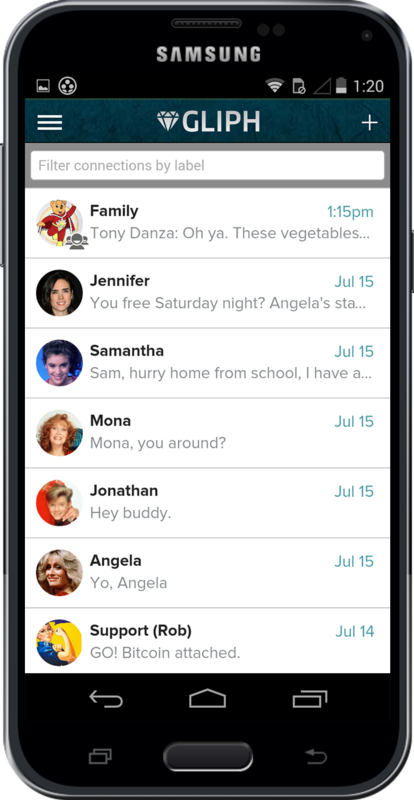 iOS 7 swipe behavior – You can now swipe back from a conversation to the Activity View, which is how iOS 7 does things. This entry was posted in Gliph Android App, Gliph iPhone App, Gliph Web App, GliphMe and tagged android, ios on January 23, 2014 by rob. Blockchain.info does a few things very well. First, it offers some great charts, stats and other interesting information about Bitcoin transactions. But secondly Blockchain.info has begun to shine as a rapidly growing Bitcoin wallet provider. Today, we’re pleased to announce initial Gliph support for Blockchain.info wallets. This means Blockchain.info wallet holders now get the same easy Bitcoin transfer as people who use Coinbase and BIPS. Whether you trade Bitcoin with Blockchain.info, BIPS or Coinbase you don’t have to bother with Bitcoin wallet addresses or their representative QR codes. You just send them a connection request, and then attach Bitcoin like you would a picture message. You must first create a wallet on the Blockchain.info website. Tap the Bitcoin option in the Menu, and choose Use a Different Wallet. 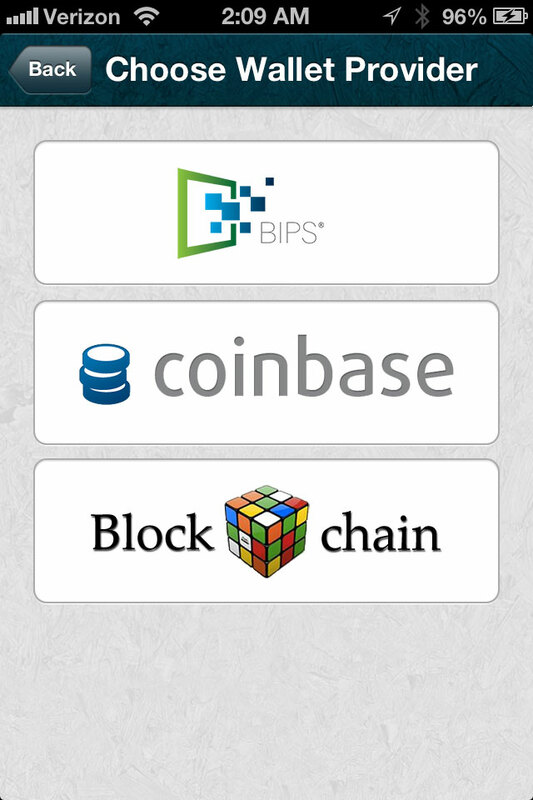 In the Choose Wallet Provider view, select the Blockchain.info logo. 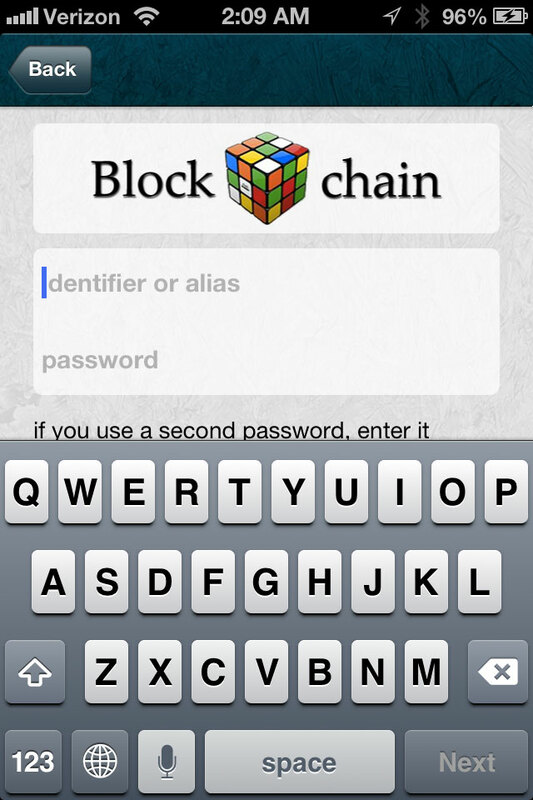 Enter your Blockchain.info identifier and your password into the sign-in page. This entry was posted in Bitcoin, Gliph Android App, Gliph iPhone App, Gliph Web App, Payments and tagged blockchain.info on September 9, 2013 by rob. 12/01/13 Update: We’re sorry to say that we are no longer supporting wallet creation or attachment from BIPS and will be phasing support for the wallet from Gliph. All Gliph users will still be able to attach wallets from Coinbase and Blockchain.info. We want Gliph to be the best way to connect and transact no matter where you live. That’s why today we’re announcing support for the Copenhagen-based BIPS Bitcoin Wallet. BIPS is well-known for its free Bitcoin merchant solutions, but it also offers a solid Bitcoin web-wallet for individuals. If you’re checking out Bitcoin for the first time, you can now use Gliph’s Instant Wallet Creation to get started with a wallet on BIPS. If you already have a Bitcoin wallet on BIPS, you can attach it to your Gliph account with a simple sign-in process. No matter what Bitcoin Wallet provider you use on Gliph, you get the convenience of easily sending Bitcoin with other people using Gliph’s unique chat-based Bitcoin transfer system on iOS, Android and the Mobile Web. We’ve had our eye on stronger international support in Gliph for some time, and are pleased extend Gliph’s Bitcoin support to BIPS’ userbase and its popularity in Europe. In July, we added a server in Ireland, so everyone in Europe should have a faster experience with Gliph overall too. Our team has been planning to add multi-wallet since we first released Gliph with Bitcoin at the Bitcoin 2013 conference. We have some exciting ideas for deeper integration of Bitcoin into Gliph’s platform in the future and hope you start enjoying easier transactions with people across the globe today! In case you missed the links, you can learn about Bitcoin here, or try out Bitcoin via a BIPS wallet now on the Gliph for iPhone, Android or the Web. Update: Our cooperative press release with BIPS is now available here. This entry was posted in Bitcoin, Gliph Android App, Gliph iPhone App, Gliph Platform, International, Payments and tagged BIPS multiwallet on August 19, 2013 by rob.